President Donald Trump has designated Indian American Neil Chatterjee of Kentucky to be the Chairman of the Federal Energy Regulatory Commission (FERC). 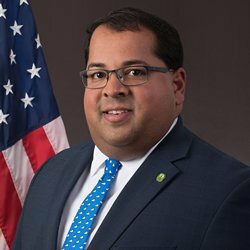 According to his bio on FERC’s website, Chatterjee served as chairman from August 2017 to December 2017, and will now serve again to fill in for Kevin McIntyre, who is facing some ongoing health issues, according to a Politico report. Prior to joining the Commission, he was the energy policy adviser to U.S. Senate Majority Leader Mitch McConnell (R-KY). He also worked as a Principal in Government Relations for the National Rural Electric Cooperative Association, before that, and as an aide to House Republican Conference Chairwoman Deborah Pryce (R-OH). Thus through the years, Chatterjee has played an integral role in the passage of major energy, highway and agriculture legislation, according to his bio on FERC’s website. Chatterjee is a graduate of St. Lawrence University and the University of Cincinnati’s College of Law; he began his career in Washington D.C. with the House Committee on Ways and Means. Chatterjee is married with three children.